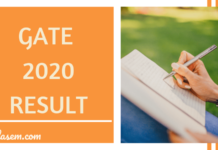 GATE 2019 Result – IIT Madras has released GATE Scorecard 2019 for qualified candidates, on March 19, 2019. GATE Result 2019 was announced March 15, at 4:56 PM. It is available at GOAPS on gate.iitm.ac.in. Candidates can check and download the scorecard and result of GATE 2019 from the link below. Details needed to check the result are enrolment id / e-mail id / registration id and password. The qualified candidates of GATE will now get admission in PG Engineering and Architecture courses offered by IITs, NITs, IIITs, and CFTIs. PSUs also recruit candidates on the basis of GATE 2019 Result. 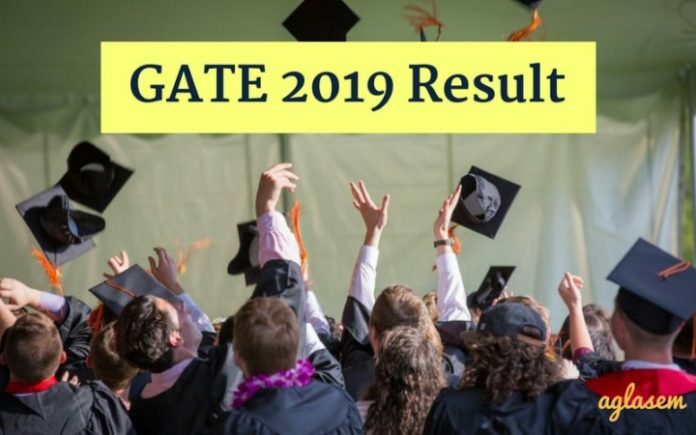 Know more details about GATE 2019 Result, Scorecard, Cut Off, and more from this page. Every year, around 8 to 9 lakh candidates apply for GATE and of this only 16% – 17% qualify the examination. The candidates can check the GATE Result Date 2019 from the table below. Check Result: Click Here to check GATE 2019 Result. The GATE 2019 result and scorecard are released separately. IIT releases GATE scorecard after announcing the result and in it, the AIR and normalized marks are mentioned. You can check all the details in GATE 2019 result and scorecard from below. Raw maks (out of 100). Photograph, and signature of the candidate. GATE Score (Out of 1000). The validity of GATE 2019 Score. The number of candidates who appeared in that subject paper. How is GATE 2019 Raw and Normalized Score Calculated? 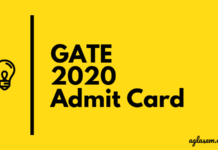 GATE 2019 Raw Score: The raw score GATE or generally referred to as GATE result is calculated on the basis of GATE 2019 marking scheme and final answer key. The answers marked by the candidates are cross-checked with the final answer key of GATE and then as per the marking scheme, the marks are allocated and deducted for right and wrong questions. Raw score = Number of correct answers x Marks for that question as per scheme – Number of incorrect answer x Negative marks for that question as per the scheme. Recommended: GATE 2019 Cut Off for IIT and CCMT Admission. 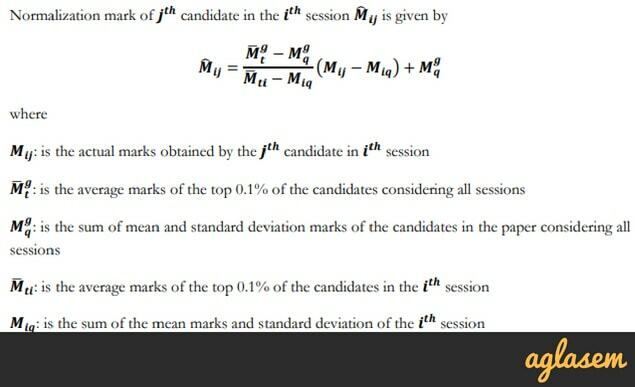 For single session papers, the raw marks are used for calculation of GATE Score. For multiple session papers, normalized marks are used. 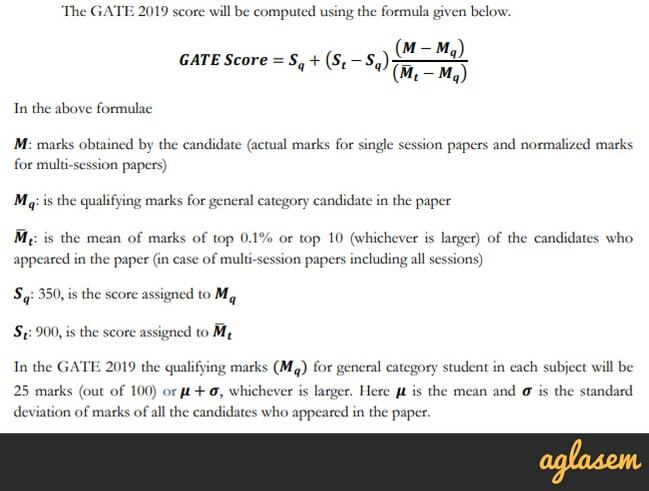 For calculation of GATE 2019 Score, the following formula is used. The scorecard of GATE 2019 will release on March 20, 2019. It will be valid for 3 years, from the date of GATE 2019 Result announcement. the scorecard is only issued to thjose candidates who qualify the exam by scoring more than the GATE cut off marks. 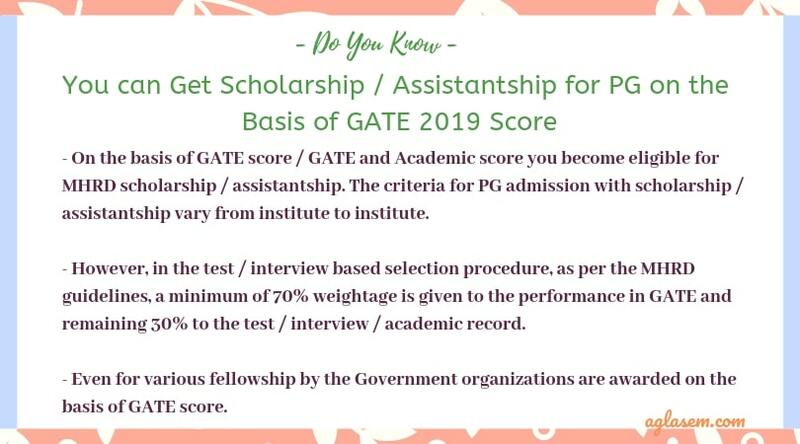 Through the scorecard of GATE, the candidates get to know their GATE 2019 Score and All India Rank (AIR). The scorecard of GATE is important and the candidates should save it properly, as it will be needed during the admission / recruitment. Step-1- Click on the direct link which will be available on this page as soon as the GATE 2019 Score is released. 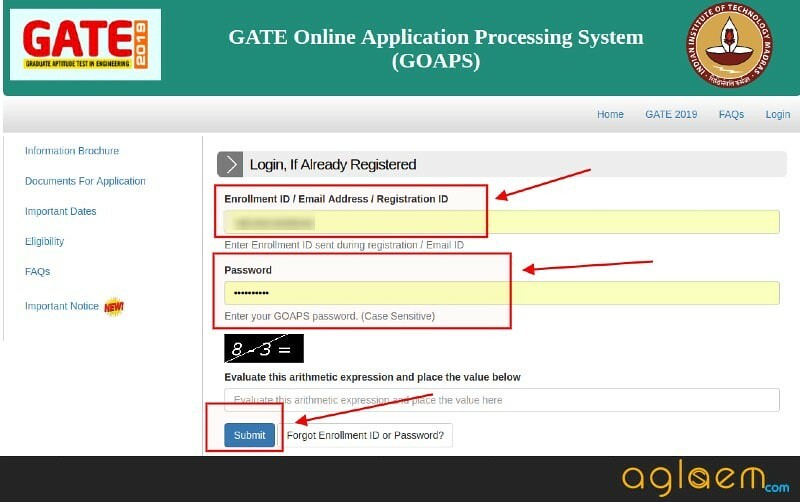 Step-2- On clicking the direct link, candidates will be directed to the GATE 2019 Login, i.e., GOAPS. 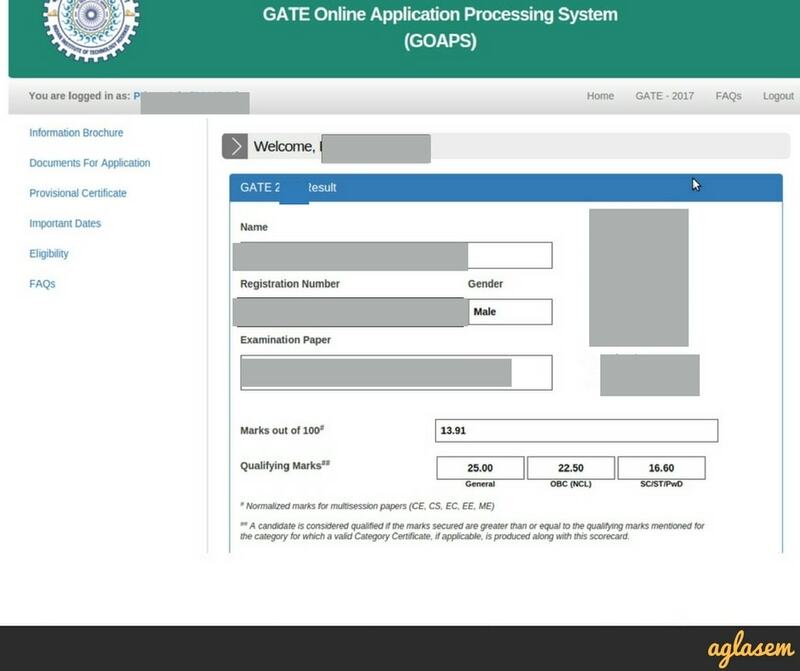 Step-4- Click on the “Submit” button and then on the dashboard, look for the link of GATE Scorecard 2019. Sample Image of GATE Scorecard is given below. What After GATE 2019 Result? IITs only grant admission to the top candidates. No centralized counselling is held for IIT M.Tech / M.E admission and each IIT holds its individual counselling. Candidates have to apply separately for each IIT, however, the seat allotment result is announced through GATE COAP (Common Offer Acceptance Portal). Candidates should not get confused, they need to register for IIT and COAP. What is Good GATE Score for IIT Admission: A good score of GATE is that which guarantees admission in IIT. Well, there is no fixed score at which IITs grant admission. However, candidates can check previous year opening and closing rank to get an idea about the good score. National Institute of Technology (NITs) and Indian Institute of Information Technology (IIITs), and Centrally Funded Institute (CFTIs) also grant admission on the basis of GATE 2019 score. For this, Centralized Counselling for M.Tech (CCMT). CCMT 2019 will be conducted by one of NIT and more than 40 institutes participate in it. The Process of CCMT 2019: GATE 2019 candidates have to register for CCMT 2019, on ccmt.nic.in. Once registered, the candidates will get the option to submit choices for course and college. Following this, on the basis of GATE score, the seat allotment result will be announced. BHEL – Bharat Heavy Electricals Limited. SAIL – Steel Authority of India Limited. GAIL – Gas Authority of India Limited. HAL – Hindustan Aeronautics Limited. IOCL – Indian Oil Corporation Limited. NTPC – National Thermal Power Corporation. NPCIL – Nuclear Power Corporation of India Limited. ONGC – Oil and Natural Gas Corporation. PGCI – Power Grid Corporation of India. Enrollment ID/ Email ID/ Registration ID. 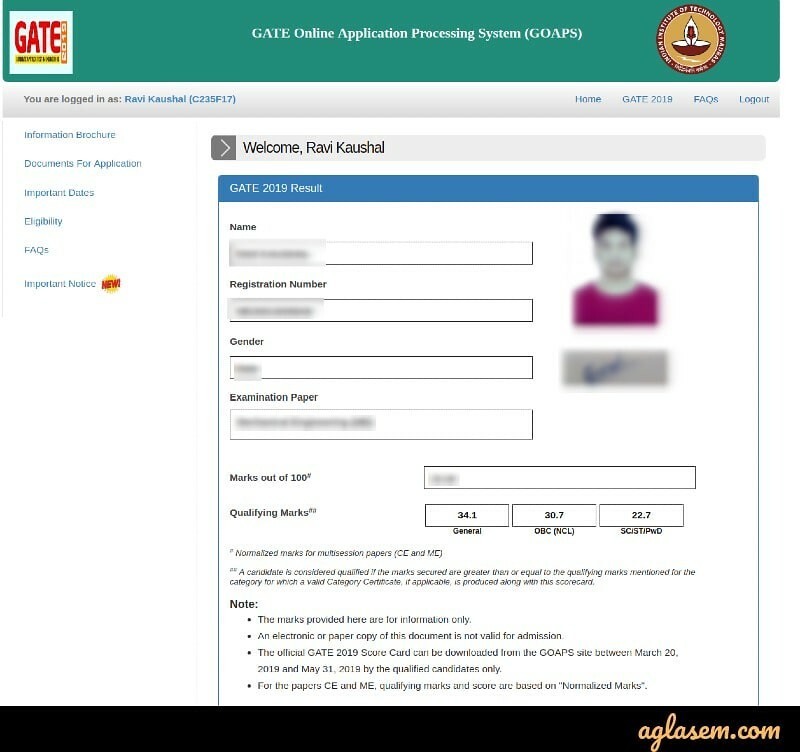 Measure 1: You registration number and enrolment id is mentioned on the application form and admit card of GATE. You can check it there. 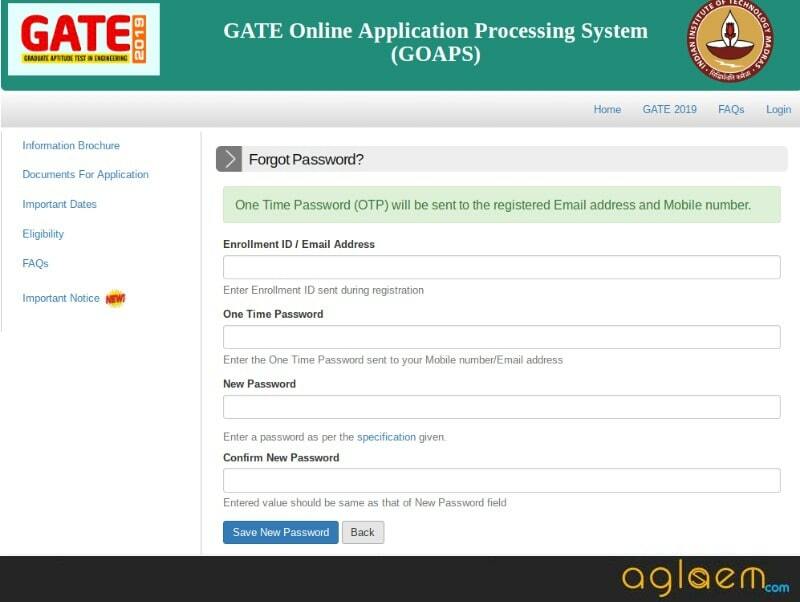 How to Regain Enrollment Id or Password to check GATE 2019 Result? On the GOAPS, you have to click on the “Forgot Enrollment ID / Password” button. In the next screen, you will get two options, first choice is to retrieve the password and the second choice is to reset the password. If you do not have an OTP, then in such a case, select option 1, and if you have an OTP already then click on the Second option. If you have selected Option 1, then you have to enter your registered mobile number and Enrollment ID / Email ID. Then click on the “Reset Password” button. However, if you have selected Option 2, then you will have to Enrollment ID / Email Address, OTP, New Password and confirm a new password. Next, click on “Save new password” button. On the basis of GATE 2019 cut off, the candidates are termed qualified. The cut off for GATE is announced with the result. It is provided category wise, for General / OBC / SC / ST / and PH candidates. The score of cut off for the General candidates go highest and that for SC / ST / PH are the lowest. The cut off of GATE for this year is yet to be announced. However, candidates can check previous year GATE 2019 cut off from the table below. How to Check GATE 2019 Result? Click on the direct which is going to be provided on this page for checking GATE Result. Next, the candidates need to log in by entering their Enrollment ID / Email Address / Registration ID and Password, as generated during the application process. Then, click on the “Submit” button, after which in the next screen, click on the relevant link for Result. Finally, you can download and take a print out of the Result for future reference. Sample Image of GATE Result is given below. Graduate Aptitude Test in Engineering (GATE) is an online examination, which is held at the national level. It is conducted by the Indian Institute of Technology (IITs) to grant admission in M.E / M.Tech / M.Arch / Ph.D program. Every year, one IIT is given the responsibility to conduct the exam. This year, the exam was conducted by IIT Madras and it is expected that next year, it is expected, that IIT Delhi will hold the exam. 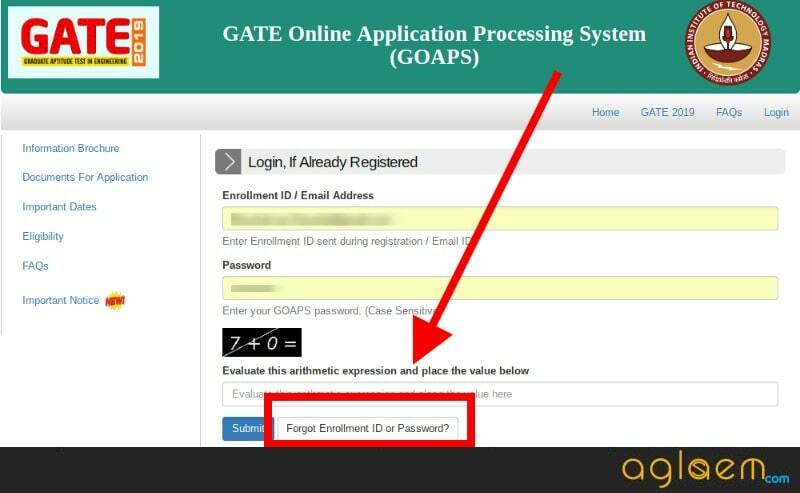 The admission through GATE is granted on the basis of GATE AIR and GATE Score. If you have any queries regarding GATE 2019 Result, feel free to ask in comments below. I forgot my password. I insert my mail I’d and mobile number which given in application but it shows enrollment not found what can I do??? You can check your email ID for registration no.